The Denso HC36II Series has been discontinued. No direct replacement is available. Compact & lightweight scanner ideal for POS or PC connection. The Denso HC36II Series is ultra lightweight and ergonomic design which makes it weigh in at around 4.2oz. This is less weight than other similar models previously available, which allows for all-day use without fatigue. When held further away, the HC36II Series can read the barcode of up to 200 mm (7.9") wide, something that has been a problem for conventional CCD scanners. This new feature makes the HC36II Series a valuable tool in a wider range of uses, like in distribution. The HC36II Series is available in two types, the conventional "touch reading type" and new "distance reading type" and with various interface options, including RS-232C, OCIA, CMOS/bar-image, and keyboard emulation. 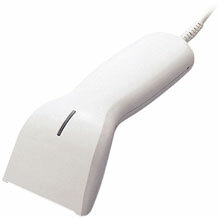 Distance trigger USB model with straight cable.